England are planning to turn the Millennium Stadium into a World Cup gold mine worth more than £50m. Up to eight matches are being earmarked for Cardiff during the tournament from September 2015 – two more than the Welsh Rugby Union had bargained for. In that event it will be a huge earner for Wales with the Union standing to make at least £6m in hire fees. Manchester United’s withdrawal of Old Trafford has made the Welsh capital an even more important centre for England’s 2015 operation, crucially so in their bid to cover the £80m guarantee given to Rugby World Cup Ltd. The 48-match schedule will be made public later this month pending approval from the five-man RWC board. It’s understood that Cardiff is due to host six matches during the pool stage and two quarter-finals. The English organisers had planned to stage three fixtures at Old Trafford, the only Premier League ground with a capacity beyond the 74,500 seater Millennium Stadium. The Millennium generated gross ticket revenue of around £5m for last month’s Wales-England Six Nations’ decider. With the customary World Cup hike in ticket prices, that figure could virtually double to £10m per quarter-final. Wales charged a top price of £80 during the Six Nations. RWC jacked the figure up to £193 when they hired the Millennium for the France-All Blacks match in 2007. Even an average cost of £150 in 2015, a conservative figure given RWC’s tendency to make their stadia sweat as never before, would be enough to generate more than £10m from a full-house in Cardiff. Money will be talking so loud that it could deafen Australian objections to allowing Wales home advantage for the pool match between the countries. They made their formal protest after the World Cup draw had put the Wallabies in the same pool as the official hosts, England, and the chief supporting hosts, Wales. They called for the abandonment of an agreement allowing Wales to play any of their pool matches in Cardiff. World Cup insiders believe that the argument over Wales playing all their pool matches at home bar the one against England will be subsumed by commercial considerations. 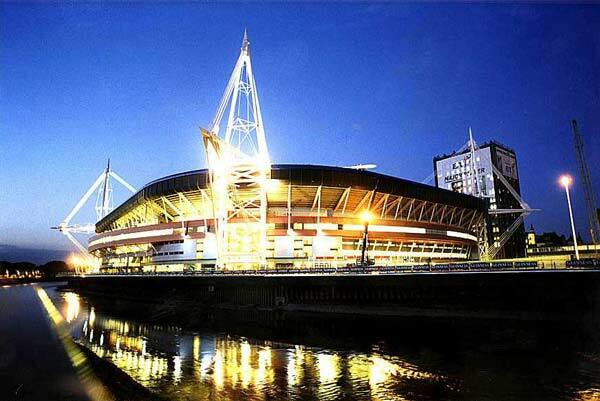 In addition to four home pool games for Wales and two quarter-finals, the Millennium Stadium is a contender for two of the tournament’s three most attractive pool matches. New Zealand v Argentina, France v Ireland and South Africa v Samoa all have enough box-office appeal to guarantee a Cardiff killing. When they won the World Cup, the RFU declared their aim to sell three million tickets, compared to 2.4 million in France six years ago. Eight Millennium sell-outs would guarantee them 600,000 and more than compensate for the loss of Old Trafford.